Terms of Service Agreement | Welcome to Dusten Lyvers' Official Website! By scheduling an appointment with Dusten Lyvers owner of Dusten Lyvers, LLC you are agreeing and understand that Dusten does not choose which people come through in a reading, Spirit directs the entire process. All actions taken on information given in a reading is the sole responsibility of the individual taking those actions. 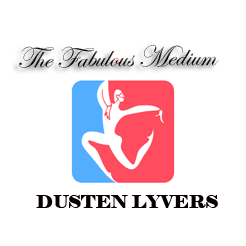 Dusten Lyvers will not be held responsible for any actions or decisions made after your scheduled appointment- this includes anything over Skype, Facetime, Telephone, Private Readings, Group Readings, Fundraisers, Events, or any of Dusten’s services. Dusten is not a licensed mental health professional, medical physician, or attorney, and any decisions taken regarding such fields should be done so with consultation from a licensed professional in that field. All services are for entertainment purposes only. Thank you!